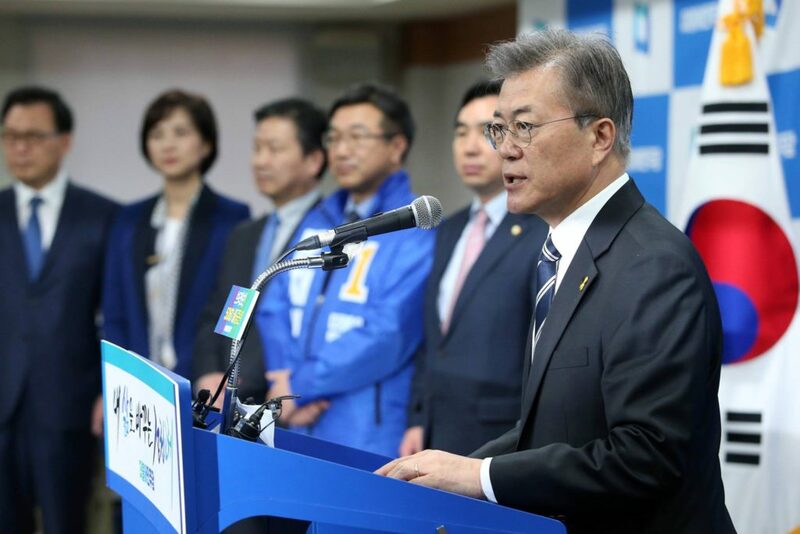 When Moon Jae-in (문재인) won his party’s nomination last Monday, news outlets across the globe immediately proclaimed that the progressive’s nomination all but assured Moon’s victory in the snap presidential election set to take place on May 9. Nevertheless, the next 27 days promise to be some of the most tumultuous in the history of South Korean democracy, with former president Park Geun-hye (박근혜) under arrest on bribery and other corruption charges and with US president Donald Trump’s administration taking an increasingly bellicose line over North Korea’s nuclear provocations. 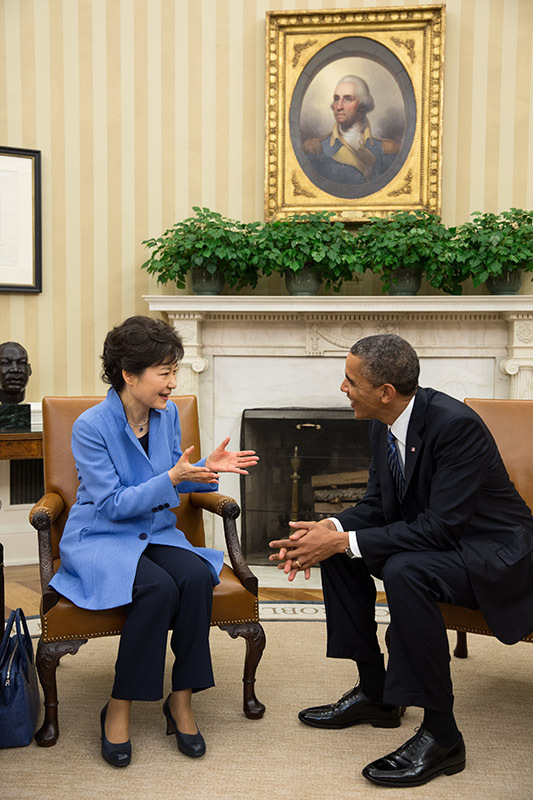 Park’s removal from office brought forward the presidential election previously scheduled for December. 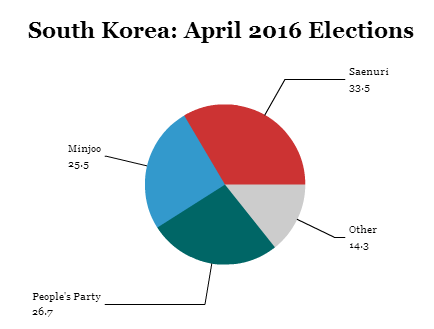 Last week’s primaries among all of South Korea’s major parties have effectively settled the presidential field. Almost immediately, though, Moon’s opponents started lining up behind another progressive alternative — former software engineer and entrepreneur Ahn Cheol-soo (안철수), who kicked off his general election campaign by taking a ride on Seoul’s subways. The hint wasn’t subtle: Ahn is an outsider who understands the problems of everyday Koreans. It set off an election dynamic that polls say, all of a sudden, is now too close to call. The sudden Moon-Ahn horse race elevates a long-simmering rivalry that’s defined the South Korean opposition for the better part of the 2010s. Moon and Ahn both hold relatively left-wing views by the standards of South Korean politics. But Ahn is increasingly viewed as more pro-American, given Moon’s skepticism about the US-built Terminal High Altitude Area Defense (THAAD) anti-missile system that North Korea and China view as an American provocation. While both Moon and Ahn previously opposed THAAD, which could deploy within weeks, the two candidates are now voicing at least qualified support for its deployment if North Korea’s aggression continues. But Moon has warned that THAAD’s deployment should be halted if North Korea resumes negotiations and freezes its nuclear weapons program. More broadly, South Korean business elites like that Ahn comes from an entrepreneurial background. Idealistic voters, meanwhile, consider Ahn an untainted maverick who can break the cycle of corruption that’s dogged several administrations from both the left and the right and the ‘chaebol’ conglomerates than dominate the South Korean economy. (Notably, Samsung CEO Jay Y. Lee (이재용) was arrested in February as a result of the wide-ranging corruption scandal that engulfed Park’s presidency, accused of paying up to $40 million in bribes to Park in exchange for favorable treatment for Samsung). Though it’s only been two weeks since South Koreans upended polls to deliver a shock verdict in parliamentary elections, the country is now pivoting toward its next presidential election — which is nearly 20 months away. Taking place nearly two-thirds of the way through the five-year term of president Park Guen-hye (박근혜), the election was an opportunity for Park to solidify her grip on the National Assembly, as well as her own party, the conservative Saenuri Party (새누리당, ‘New Frontier’ Party) by winning a more solid majority in South Korea’s 300-member unicameral legislature, the National Assembly (대한민국 국회). 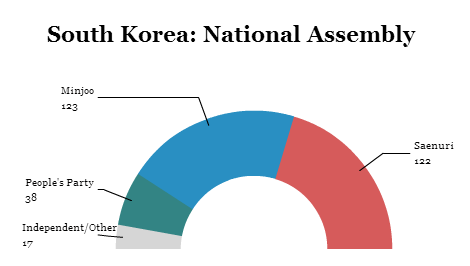 Despite poll predictions that Saenuri would take advantage of a split opposition and win an even wider majority, the party instead lost ground, falling further away from an absolute majority, winning just 122 seats, 24 fewer seats in the National Assembly than the party held before the elections. Park, like all South Korean presidents, is limited to a single term in office and, in some regards, she became a lame duck president from the first days of the 2013 inauguration of the country’s first female president. That hasn’t stopped Park from wielding power through a very strong executive branch. 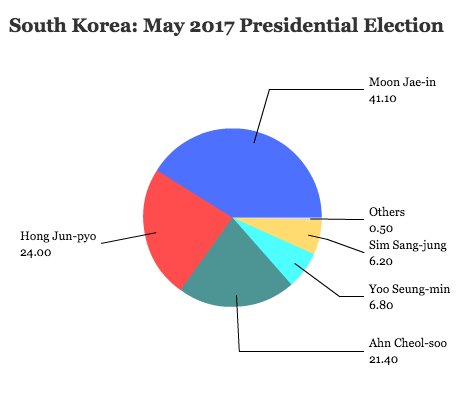 Saenuri’s defeat, however, and Park’s failures in particular, mean that the country is now shifting towards the posturing among Park’s opponents, including those within other Saenuri Party factions, to plot a path to the presidency in an election that will not be held until December 20, 2017. 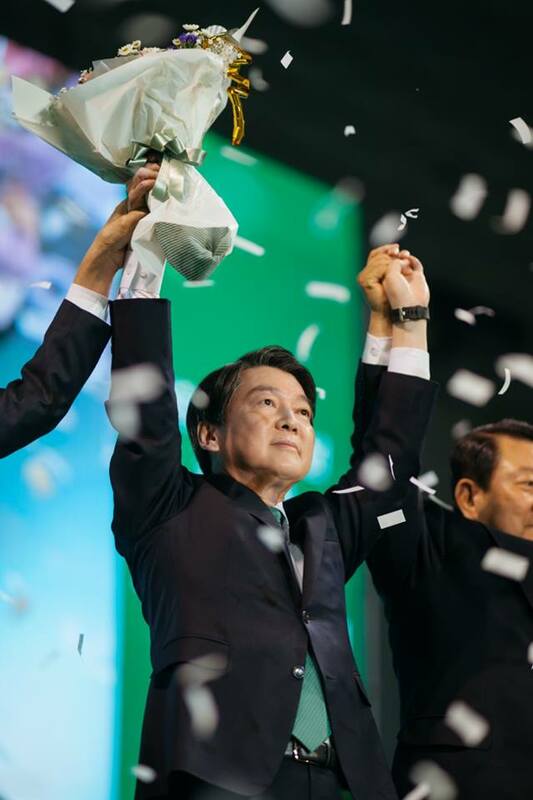 The results will give hope to the traditional center-left opposition party, the newly renamed (as of last December) Minjoo Party (더불어민주당), a successor to what used to be called the Democratic United Party, which won 123 seats — one more than Saenuri. 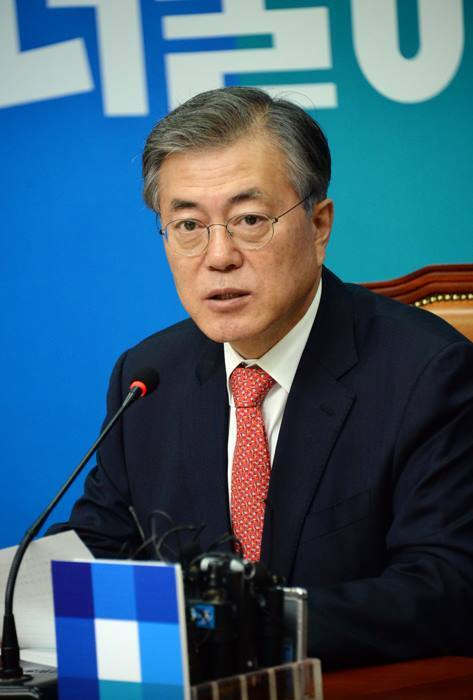 That could embolden several top figures within the party to mount a 2017 presidential bid, including Moon Jae-in (문재인), the party’s former leader and its 2012 candidate against Park. But the results will give even more hope to the newly formed, as of February, People’s Party (국민의당), an alternative liberal party that has pulled supporters away from Minjoo. Its leader is Ahn Cheol-soo (안철수), a software entrepreneur, businessman and academic, who burst onto the political scene as a potential presidential candidate in 2012. He will now almost certainly be a contender in the 2017 election. Though the People’s Party only won 38 seats, it actually won more votes than Minjoo.